I came across Free Spirit Publishing a while ago when I was searching for books and other things to help our daughter. She is on the mild end of the autism spectrum and also has ADD/ADHD to go along with it. She’s nine now and still has a lot of trouble areas. For over 25 years, Free Spirit Publishing leads in learning tools to support any child’s emotional and social health. They have a range of books and products to meet any child’s needs at all age levels whether they have any learning disabilities or not. There are books for toddlers learning to clean-up, manners, sharing, etc. There are books for teens and any child in between to help with self esteem, behaviors, grief and loss, teen depression, conflict resolution and a lot more. I was given a wonderful opportunity to work with Free Spirit Publishing on a review. When I was given the opportunity to choose which books I would like to review, I chose some of their books from their Learning to Get Along Series. I chose books that would help our daughter in her most troubled areas. There are 15 wonderful books in this series and I was fortunate to review 7 of them! All of these books in the Learning to Get Along Series is written by Cheri J. Meiners, M.Ed. and illustrated by Meredith Johnson. All these stories are written in a social story format which I think is really great. We have found that social stories are really helpful to our daughter. If you aren’t sure what social stories are, they are written in a format using “I can do this” or I can do that”. Our daughter can come to the conclusion on her own that she can do this or that to get through the problem. If she was told “to do it that way’, there’s a big chance she would ignore it. Social stories also keep things fresh in her mind because they become her own “I can” idea to help her cope. The first two books that I received to review was “Know and Follow Rules” and “Listen and Learn”. When it comes to following rules, our daughter’s biggest problem is that she doesn’t really have a real understanding of why we even have rules. Since she has that problem, she has a hard time following them because she doesn’t seem to think they are necessary. She doesn’t know exactly why they are in place. 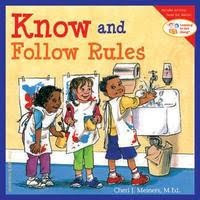 “Know and Follow Rules” teaches kids about basic rules and why they are there and why they matter. Rules are there to keep us safe, to learn, get along and to be fair to others. It does not focus on negative consequences but does focus on positive ones. The illustrations also illustrate what’s going on really well too. For example, it says “I keep my hands and feet to myself. I won’t use them to bother or hurt anyone else.” and there is a line of kids with the little girl with her hands in her pockets. The illustrations also help kids learn what to do themselves without being told what to do. 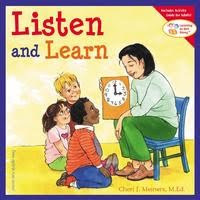 “Listen and Learn” is a story about kids being in every day situations when they need to listen. Our daughter learns why we listen, why it’s important, and how to listen well. Again, the focus is on the positive results that come from listening. This book is written in the same format with a child saying what he/she does or what they can do. For example, “When I listen, I use my body, eyes, and ears. I stay quiet. When my mouth and body are quiet, everyone can hear.” This is a big problem with our daughter because she doesn’t keep eye contact and she is very fidgety when she needs to listen. Everything in this book is a helpful reminder to her because she can think of these things in her head to help her in these situations. When it comes to play, our daughter would rather play by herself. Even at her age. Over time, she has become a little better at it and it still improves. A lot of the time if she is playing with others, it’s like she’s playing “beside” them. She is playing with them but at the same time, still separated from them. She would rather play with kids younger than her because she can control the way she plays better with younger kids. I think this is because she just doesn’t fully know how to play with her peers because she really doesn’t handle conflict well. That’s why I think “Join In and Play” and “Talk and Work It Out” goes really well with each other. 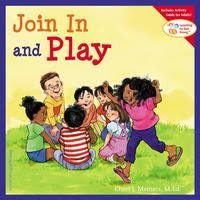 “Join In and Play” helps kids learn how to make an effort to make a friend or join in and play. This book also helps with learning to take turns, playing fair, and being a good sport. The illustrations display what is going on perfectly with real life situations as well. 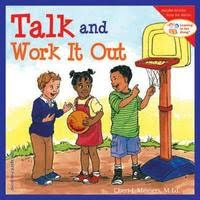 In “Talk and Work It Out”, kids can learn how to deal with conflict and how to come out with a peaceful resolution. I teaches them how to calm down, talk about it, listen to understand what’s going on, and come up with ways to solve their problem. These books have been helpful to our daughter with these problems. We were at the park one day and a little girl came up and just took her soccer ball from her and her little brother. Instead of crying and getting upset looking for someone to handle it for her, she handled it herself. She stayed calm, and told the girl how she felt about it and the girl replied with something about wanting to play with it. She was actually able to communicate to this little girl about her feelings and what the problem was. To solve the problem, our daughter asked her if she would like to play with her and our son. Like, I said, these two books go hand in hand with each other! I was very proud of her that day and I talked to the little girl’s mom about myself because she had come up to us mortified that her little girl did that and we all watched how it all played out. It was great progress for our daughter that day. All kids at one point in time always try lying about things to keep themselves out of trouble. We have that problem with both our daughter and our 4 year old son. They tend to blame each other as typical child behavior. We did the same thing when we were kids. “Be Honest and Tell the Truth” teaches kids what’s true and what isn’t and how to tell the truth even when it is hard for them to do. “I can have courage and tell the truth when I make a mistake. I might find a way to fix my mistake and make things better.” In this example, there are illustrations that clearly demonstrates this situation. A little girl spills another boy’s milk on the table and in the illustration the little girl says sorry and shows how she fixes it. This allows children to see that mistakes are mistakes and being honest about it is best. 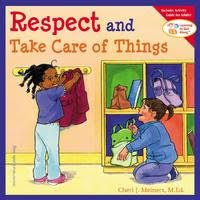 “Respect and Take Care of Things” teaches kids about respect and how we take care of things. It teaches about cleaning up after themselves, putting things back where they got them, asking permission for things, responsibility and even a little about basic environmental awareness. This is another thing that I think most kids go through at one point too. Both of our older kids like to leave things lying around without any thought that they are not taking care. “I can play with one thing at a time. After I use something, I can put it where it goes.” This teaches them that taking care of things and taking care of their surroundings is being respectful and taking care of everything around them. 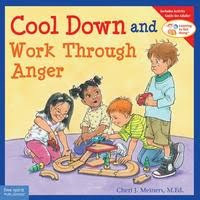 “Cool Down and Work Through Anger” is the newest book in the Learning to Get Along Series. This book has helped our daughter immensely! She doesn’t know how to express her feelings even at nine years old. This has always been a big problem for her especially when it comes to anger. This is why she has temper tantrums or complete meltdowns. It is frustrating at times because these meltdowns can be caused by the simplest of things. She likes to be in control and feel like she has control over everything. I guess it makes her feel safe that way. Since she has to have this control, she can get upset really easy if things don’t go her way. This book is a great social story for her to work through her problems. This book explains the child’s feelings and lets them know that it’s okay to have these feelings. The child in the story says “I may feel sad or frustrated when things don’t go my way or when I can’t have or so something I want. I may feel angry too.” He says how he might feel like exploding but instead of doing things that are wrong, he says finds other ways to express his anger because his feelings are still important. “All my feelings are okay…..and find a way to work through it.” Throughout the rest of the story he will say things like “I can take deep breaths or count to ten to calm down.” It’s a great social story to teach kids “I can do this” instead of doing something wrong. I absolutely love these books. I have focuses more on our daughter in my review because of the daily problems that she has but some of them have also been really helpful with our son and his typical 4 year old behavior. He has also picked up a few things from his big sister because he thinks that some things she does are okay and he doesn’t understand. These books are great for any child. They are easy to understand with simple words and great illustrations. They are great to read aloud to younger kids and they are easy stories for them to follow. These books are also great to start a discussion about these behaviors. In each book, there are also activities and things for parents that can also help their child with these behaviors. I definitely recommend the Learning to Get Along Series and highly recommend Free Spirit Publishing! Win It! Free Spirit Publishing is offering my readers a chance to win a copy of “Cool Down and Work Through Anger” for themselves. One of my lucky readers will win a copy of this great new book in the Learning to Get Along Series! *Tweet about my giveaway and leave a URL of your tweet in a comment so that I can verify your tweet (1 entry and can be done once daily) Leave a comment with URL each time you tweet. You can use the example below or use the share button at the bottom of my post. *Enter any of my other current giveaways (1 entry for each one) Let me know which ones that you entered in a separate comment. Limit 3 entries per this method (most are labeled non-giveaway posts to make it easy) although I encourage you to enter them all! *Comment on any of my non-giveaway posts (1 entry for each one) and let me know which ones in a separate comment. Limit 3 entries per this method but I love comments so feel free to comment on as many as you like! Giveaway is open to anyone. Winner will need to provide their phone number with contact information to be shipped to them. Giveaway will end July 14 @ 11:59 PM (EST). Winner will be chosen using random.org. Winner will have 48 hours to respond after I contact via email. If winner does not respond, a new winner will be chosen. Good Luck!